The big players in the insurance broking market are almost household names, and will insure anything. This works for them, but it does leave a gap for more tailored offerings targeted at specific sectors. 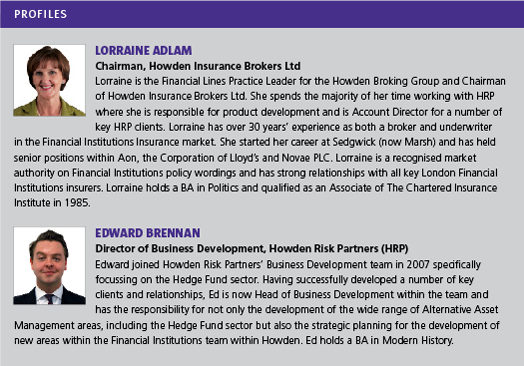 Howden, the winners of The Hedge Fund Journal award for the Leading Insurance Broker, are large – they are, in fact, ranked by Post Magazine as the third-largest City (EC3) broker – but they are not one of the monoliths, which has allowed them to offer more specific policies. A quick glance at their website shows just how specific this can get, with hypnotherapists and complementary therapy listed in their specific sector coverages. Outsiders might see hedge funds as a similarly obscure industry, but coverage of hedge funds has become an important part of Howden’s business. The broker has differentiated itself in the sector by committing to it significantly. They have 25 people in London looking after the alternatives sector – hedge funds and private equity, which have a lot of crossover. This means that, although the company is relativelyyoung – the business began in 1994, and founder David Howden is still only in his late forties – Howden has one of the best developed hedge fund insurance practices available. Some people want their insurer to remain in the background – Adlam tells of one large client who said, “I want to see you as little as possible” after the initial purchase of coverage. However, the standard role for Howden is to deliver comprehensive client service. This means talking to the client as much as possible, and being available for whatever they need. With some firms this can take the form of weekly contact, because constant dialogue can only be a good thing for both parties. This can mean more than timetabled reports. Some of their clients, including a top-10 European manager, ask that someone from Howden attends their board meetings to explain their policies. The mainstays of the hedge fund insurance industry are professional indemnity insurance and directors and officers (D&O) insurance, which Howden sell as one policy in order to avoid gaps in the coverage. In the past the insurance policies for a fund have not been top of the list of priorities, but that has had to change. The financial crisis’s effect on performance has led to a closer examination of governance standards, and scandals – most notably the Weavering Capital case – have made the boards more aware of the fact that directors and officers liability insurance is more than ornamental. If the coverage is not good enough, the board members themselves could be open to personal liability in the event of failure if investors attempt to claw back some of their losses from directors accused of committing a wrongful act. This has added the extra impetus for care in examining the fund’s insurance, alongside the obvious fiduciary duty which directors owe to the fund. The hot topic at the moment which is causing concern in the European industry is the Alternative Investment Fund Managers Directive (AIFMD). AIFMD sets down some new regulations which have a direct bearing on hedge fund insurance: in order to address Professional Liability risks managers will have to have either set aside 0.01% of their AUM in capital, or else ensure that they have a professional indemnity policy which covers 0.9% of AUM. Howden have drafted an endorsement to give a further assurance that compliance with AIFMD will not be a problem for their clients. Most professional indemnity insurance should, in any case, cover the requirements already, and they should not be too much of a shock for managers – although, in her involvement with the AIMA committee that looked at the initial consultation on the directive, Adlam saw proposals for more obligations which were “a lot more draconian”. These bespoke policies can vary, and very much depend on the strategy. For instance, funds at the private equity end of the spectrum have increasingly been looking for transactional liability insurance around merger activity. A more hedge fund-specific example is a product aimed at protecting against tax liability, which might arise as a result of something like FIN 48, for instance, or uncertain or changing regulatory regimes in emerging markets. Another theme for protection is around cyber liability. So many businesses are reliant on technology working as it should, and large amounts of money can be lost as a result of even one screen going down for an hour. For larger, unidentified problems – think NatWest’s disastrous system failure – technological problems can be catastrophic financially and reputationally. Howden’s product puts an emphasis on insurance against system failure, as well as malicious outside attacks. “Talking to our financial institution clients, the really big risk for them is that they can’t run their business because their systems go down,” explains Adlam. “I think people are getting very very exercised about cyber attacks, about the involvement of government in cyber attacks, about organised crime, and malware, and the exposures around that very anonymous crime.” Indeed, research in this area has made Howden aware of their own vulnerabilities. “As a firm we are now looking into buying it, because having done this work it has suddenly made us realise how exposed everyone is,” says Adlam. Insuring risks like these are not the core offering of Howden’s hedge fund group in the same way as PI and D&O, but it is indicative of a general attitude towards insurance which sits well with directors. Howden aim to offer protection for the myriad of risks that different funds face by responding to the needs of clients who are, after all, intimately acquainted with the concept of mitigating risk.